Cannabis is among humanity's oldest and most useful cultivated crops, and so it is not surprising to find that cannabis, in all its forms, has been intricately associated with Goddess worship in many cultures, throughout history. "Holy pot has been smoked by Goddess worshippers since before history, and was first banned by those who sought to subjugate feminine spirituality"
In most ancient hunter-gatherer societies, women balanced the males' supply of game with their collected harvest from the surrounding wilderness. Women therefore became the first to learn the secrets of plants, and how they propagated themselves. The worship of Kali, under various names, extended into the ancient Near East, and cannabis was also used by many of the worshippers of Kali's ancient world counterparts. 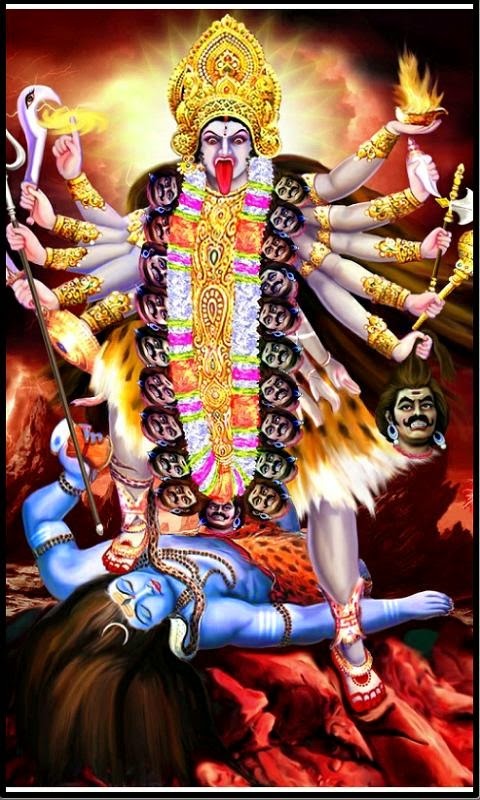 Kali is the Hindu counterpart of the ferocious and sensual Canaanite goddess Anath, (part of a similar trinity with Ashera and Astarte)who is also described with "attached heads to her back, girded hands to her waist."